The contrast couldn't have been greater. From a culture where there are strict rules about which parts of which animal can be eaten and when, to a part of the world where it's probably easier to list the animals, minerals and vegetables that aren't consumed in some fashion than those that are. 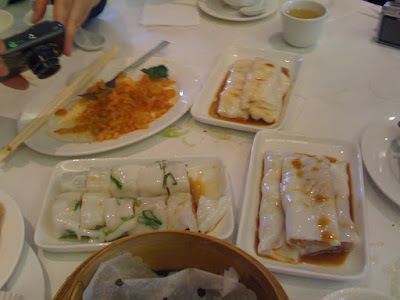 The Chinese have an admirable, if frequently terrifyingly liberal, attitude to foodstuffs, which has been well-documented on many a "Top 10 most shocking dishes in the world" list or hysterical travelogue. 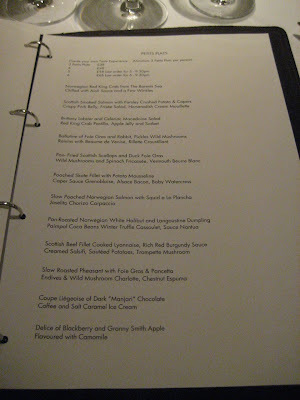 Fortunately, there was no fresh duck foetus or snake blood on yesterday's menu at the Peninsula, and quite frankly even if there had been I wouldn't have known as I left all the ordering up to Lizzie of Hollow Legs, who has the twin advantage of a Chinese heritage and an absolutely astonishing appetite. 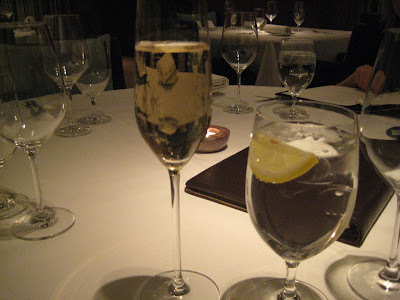 For a comprehensive and far more authoritative list of the exciting and often sublime dishes we ate at the Peninsula (along with some mouth-watering photography) I suggest you take a quick look at Helen's post at World Foodie Guide. Highlights for me included the crunchy taro croquettes which had a gloopy paste inside with a great, deep flavour, all the cheung fun which were without exception excellent coming with an impossibly silky noodle wrapping, all the steamed dumplings which were again superb, and the old favourite char sui buns which were fluffy and fresh. 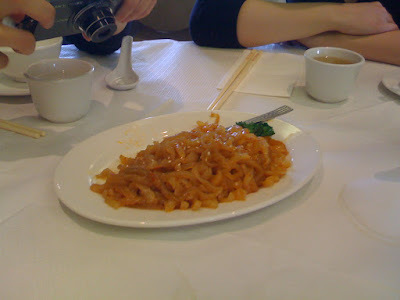 As far as unusual Chinese specialities goes, we tried a plate of jellyfish which had a rather... challenging... texture (try and imagine thick rubber bands) but came in a lovely delicate sesame oil marinade. Also new to me were squares of turnip paste, which rather than tasting like something you might have with your roast beef, had a great meaty flavour and were incredibly moreish. Once we had worked our way through what felt like every savoury dish on the menu, a few desserts arrived - delicate little custard tarts, a very fresh tasting mango pudding and a lovely subtle opaque coconut jelly. Soon after last morsel of coconut jelly had passed our lips, it was time to pay the bill, which came to an amazingly reasonable £15 each. Unsurprisingly, and in common with every other restaurant in London which has managed to combine tasty ingredients with an attractive price-point, the Peninsula was very popular, and although we managed to bag one of the last free tables at around 11:30am (they don't take bookings), by the time we left they were queuing out the door. 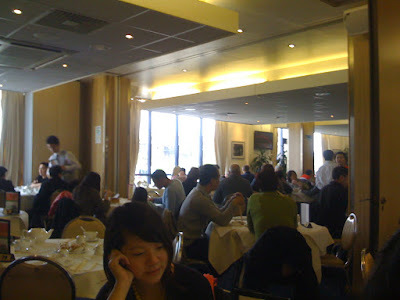 The clientele were, at a guess, 95% Chinese, which along with a marvellously surly waiter lent the otherwise characterless room a nice air of authenticity (whatever that is these days). There's even free parking for guests. What more do you want? At a casual glance, Reubens appears to be a fairly standard café/delicatessen. There's a long glass counter displaying salads and soups, a fridge containing the usual array of canned drinks and fruit juices, and a basic if functional area towards the back where you take your meal on a little wooden tray after paying for it. It's the kind of sandwich shop scattered all over the City and West End to serve office workers and tourists - nothing remarkable, nothing wrong with that. 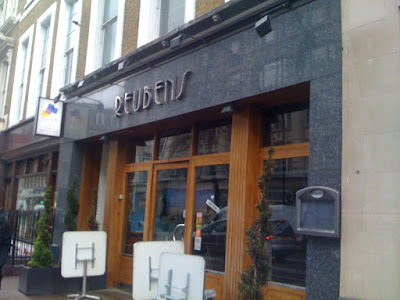 But Reubens has a trick up its sleeve - it claims to be the only kosher restaurant in the West End, its specialities include home salted beef, house chicken soup and Lockshen pudding, and its clientele, judging by my visit yesterday lunchtime, are almost entirely sombrely-dressed Jewish men. For the first time not a very long time, I felt slightly out of place as I shambled in in my work jeans and hoodie, but fortunately I had kosher über-blogger Anthony Silverbrow to guide me through the ordering process and deflect the scorn of the belligerent staff - something else Reubens are justly famous for. 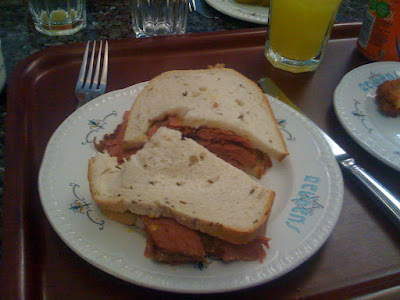 In true New York deli style, we began with a salt beef sandwich in rye bread. It was actually very good indeed. Anthony apologised for not asking for the fat to be left on, as this would have been even better, but even "lean" the meat was moist and tasty and the rye bread soft and fresh. It also came with two plates of superb pickles - a sweet and crunchy large sliced gherkin and a delicate lightly-pickled cucumber flavoured with I think bay leaf. 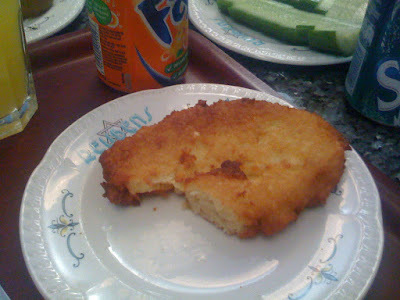 All of it much better than it has any right to be, and accompanied by an artery-busting deep-fried potato latke with an addictive crispy crunch. 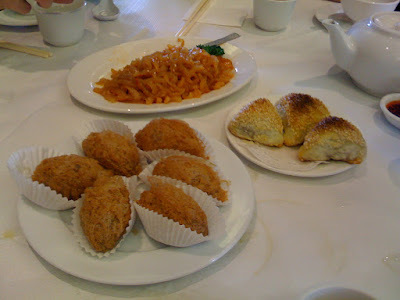 For dessert (what, you think a pound of salted beef and a deep-fried potato cake is enough for lunch?) we sampled the house specialty Lockshen pudding, a rather unusual creation made with noodles but which was nevertheless moist and sweet and delicious, flavoured with sultanas and cinnamon. 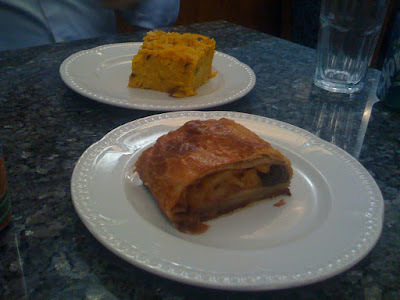 A hot apple strudel was similarly satisfying, with a thick, moist pastry coating and containing a generous portion of spiced fruit. It is a very pleasant surprise that after the best part of five years living in London there are still food cultures and traditions that go largely ignored by the rest of the city. 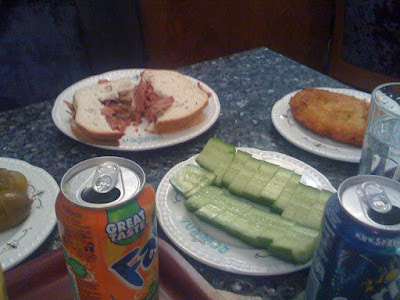 Reubens is understandably popular with the Jewish diners of London but deserves to be on the list of anyone around these parts who want a tasty, hearty lunch for not much money. Of course, whether the diners of Reubens want their favourite local kosher joint to be inundated with curious Gentiles is another story. 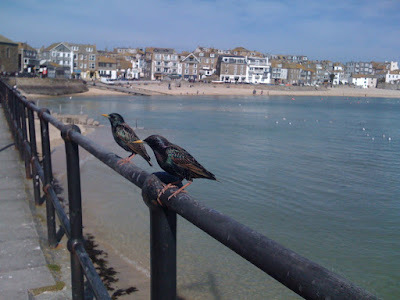 Even in chilly and blustery late March, St Ives is a popular place. While the sun was out, the shops and bars on the waterfront were seemingly never short of customers, and the chocolate-box narrow streets and whitewashed cottages behind teemed with day trippers and young families. 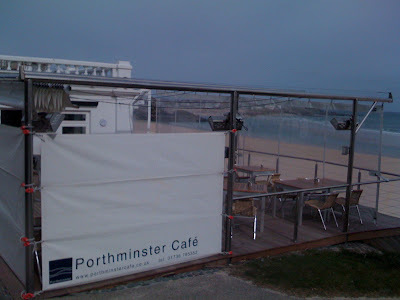 Heaven knows how difficult it is to get a reservation in the Porthminster Beach Café in season, for even now, from the moment they open for lunch until late into the evening, it seems every table is taken. And beautiful though lunch in the daytime would have been, above the stunning aquamarine waters of Porthminster Bay, we had somehow, by sheer fluke, snagged a table for early evening on Tuesday. My starter was some local St Ives beef, served with a kind of coleslaw and a parmesan crisp. 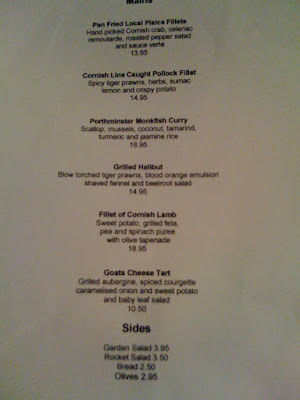 The beef was excellent - a great, deep flavour and seasoned very well, a perfect example of intelligent local sourcing. And I always think anything crispy goes well with beef - I'm a sucker for strong texture contrasts. The only slightly off note were a row of weird dried olives which tasted of cardboard and didn't really add much. But other than that, a great start. 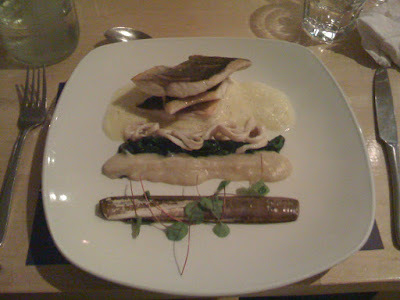 Things continued to improve with the arrival of bream fillets (my second portion in two days) and razor clams. 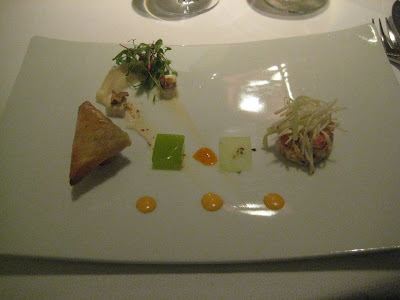 Quite aside from being a stunningly presented plate of food, each element of the dish was cooked to a very high standard. The bream was delicately filleted and cooked expertly, the vanilla froth matched the fish very well, and a row of shredded razor clam meat added another texture layer. Top stuff. 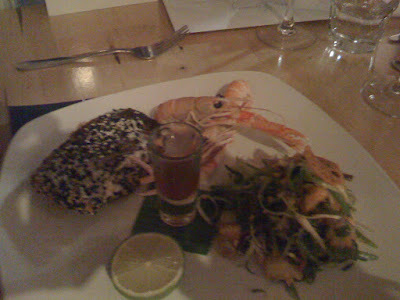 Similar noises were made around the table, the organic salmon and langoustines being another highlight. 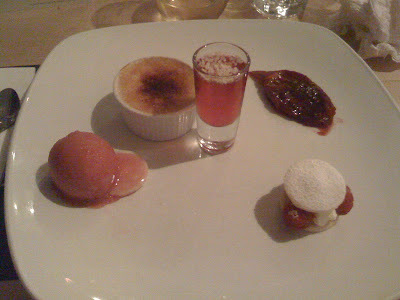 For dessert, I was served a pretty selection of five different sweets - a crème brûlée, a dab of homemade fig jam, a raspberry shortbread, a superb fruit sorbet and a playful shot of fruit jelly topped with popping candy. A riot of texture contrasts and displaying a range of cooking techniques, only the questionable seasonality of raspberries detracted from what was otherwise an entertaining and delicious way to end the meal. 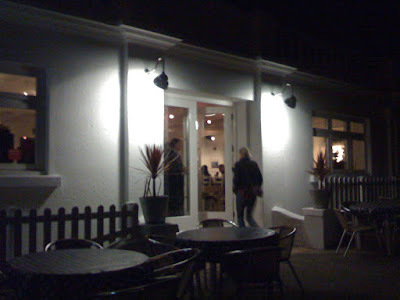 So, as it turned out, Porthminster Beach Café is wildly popular for a very good reason - it's a damn fine restaurant. Not only does it have the advantage of probably the best location for any restaurant I've visited outside the Costa Brava, but the food is intelligent and superbly executed and considering they could probably charge double these prices and still have them queuing in the street, very reasonably priced indeed. Residents of St. Ives will no doubt be completely unsurprised by this glowing review, but for anyone who has yet to visit this devastatingly pretty part of the world, Porthminster Beach Café should be top of your list. It is very rare for a self-confessed restaurant addict and food snob like myself to turn up for dinner in any town or city in the world without any idea of where I'm going to eat. Research is 90% of the work done for you, and although you can never completely insure yourself against a bad meal, as even the most reliable places slip up occasionally, your chances of failure are far less. 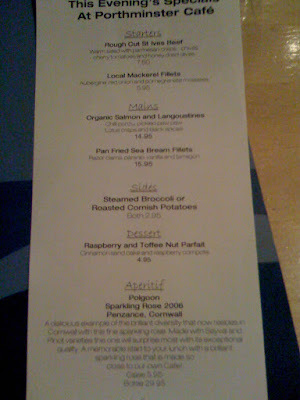 My problem with St. Ives wasn't that I didn't get any tips or recommendations from fellow foodies (I did), or that review sites and online press were short of ideas in St. Ives (they weren't), it was that every single review from every single individual and site pointed to the same place - The Porthminster Beach Café. Which was all well and good, but I wanted somewhere different for the first evening, even if it meant - shock horror! - turning up to somewhere I knew nothing about and just hoping for the best. Of course, choosing a restaurant is never simply a case of sticking a pin in a map. You always have at least one clue to the standard of cooking - the menu. 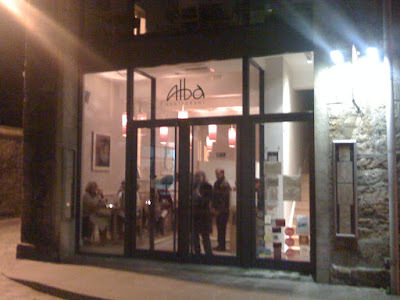 And it was the menu at Alba that made it stand out over the half dozen or so similarly priced eateries along the seafront at St. Ives. Nods to local ingredients, a very reasonably priced early evening set menu, and some interesting if not overly ambitious sounding dishes, it all made very good reading. 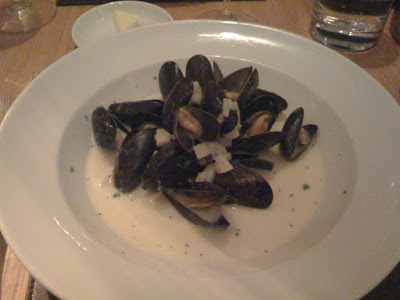 First up, a bowl of steamed Fowey mussels. 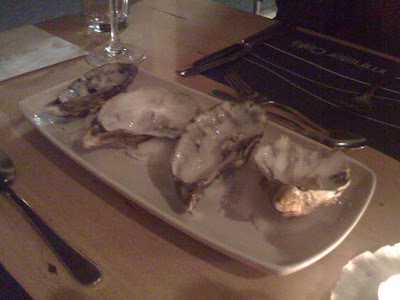 The mussels themselves were fresh and meaty and came in a generous portion for a starter, but unfortunately the sauce was quite bland. Even some more robust seasoning would have helped out here, but instead all the flavours mentioned on the menu (cider, apples) were drowned in a sea of cream. Not great, but then I did still finish them. 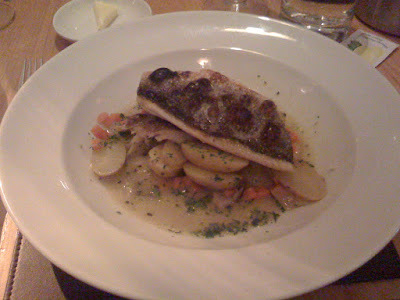 The Alba redeemed itself with my next course of bream and artichoke barigoule. The fish itself was perfectly cooked, with great meaty, flaky flesh and a very satisfyingly blistered and crispy skin on top. The barigoule (a sort of artichoke stew, according to Google) was delicious, the sweet flesh of the artichokes sitting very well with the earthy fish and boiled potatoes. It was perhaps a dish only one short stop away from decent home cooking, but to be fair we were barely paying more than decent home cooking prices, so I suppose it made sense. 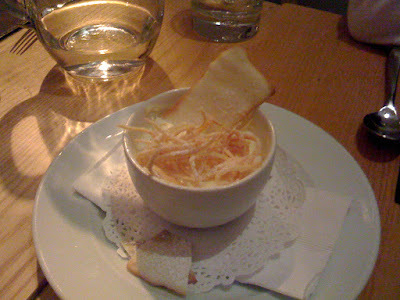 My dessert was a quite lovely pot of lemon posset, served with a sprinkling of candied lemon rinds and coconut biscuit. Although the rinds were a little chewy, the biscuits a little crumbly and the posset on the runny side, the flavours here were all great and easily made up for the slips in execution. 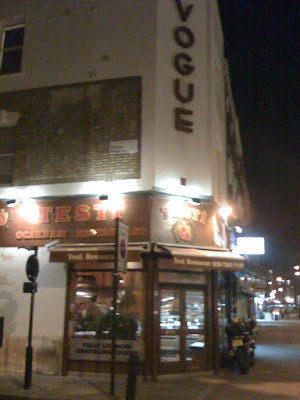 There's something commendably unapologetic about the way Testi, an Ocakbasi grill in Stoke Newington, displays its most (in)famous ingredient in their front window. 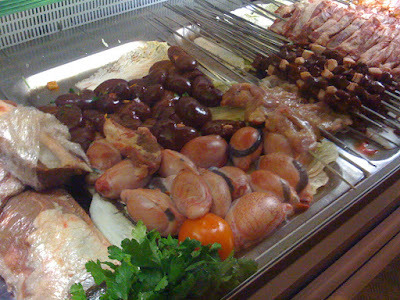 There, pride of place in one of those glass cabinets a high-street kebab shop may use to hold marinating chicken shish or lamb koftes, are a dozen alarmingly large raw lamb's testicles, looking like fleshy plums next to the more prosaic rib joints and kidneys. I had made a special journey to Testi to eat these things, and I wasn't about to change my mind, but I do have to admit to a certain amount of trepidation once I was staring at them in the flesh, so to speak. Not exactly the most appetising of items, are they? Pale and swollen, with strange dark slug-like tubes running down the side; it's largely a cultural thing I'm sure, but it's not hard to see why they are somewhat of a rarity at your local butchers or neighbourhood restaurant. It's also not too surprising you don't read much about them on food blogs or in the mainstream press, as attempting to write a review of a plate of testicles without slipping into Carry On territory is a bit of a minefield. Let's see how I do. But before the main event, a couple of starters. The house hummus was a pretty standard affair - creamy and with good texture but missing anything to lift it out of the ordinary. And despite the house bread being fresh out of the oven it was strangely tasteless - this may be the style in these places, as all Turkish bread I've ever tried has been lacking in this department. However a plate of Albanian-style chopped liver was absolutely wonderful, the moist, char grilled meat balanced with the delicately pickled onions and the dish as a whole lifting these cheap ingredients into something really special. 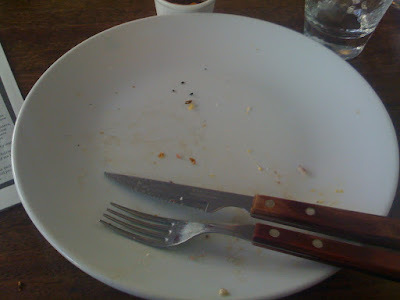 This plate was cleaned in record time. 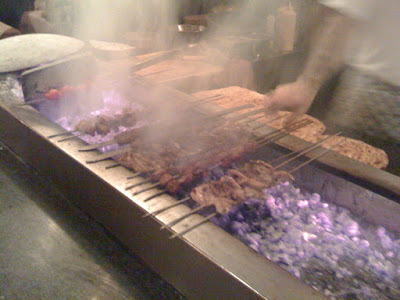 So I imagine some of you are wondering what marinated, char grilled lamb's testicles taste like. The description 'offaly' is probably a little obvious, but it's true that the meat itself had that dense, smooth texture of, say, brain. Not unpleasant but rather unsatisfying, a little bit like Quorn. What made the dish was the spicy marinade, which created a lovely crust on the little nuggets of meat and added complexity to what I'm guessing raw is a rather uniform, uninteresting product. The main point is, I've tried it now, and didn't hate it, and so now I don't need to again. Job done. 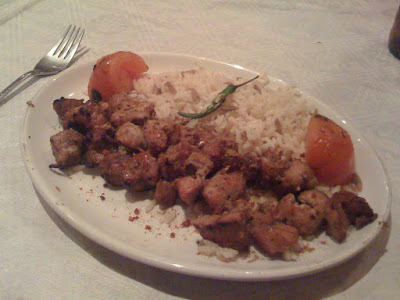 Amongst the other mains brought to our table was a few grilled quail - perfectly seasoned, and benefitting very well from the char from the grill, and some genuinely superbly cooked lamb chops, again seasoned perfectly and boasting a generous blackened crust. 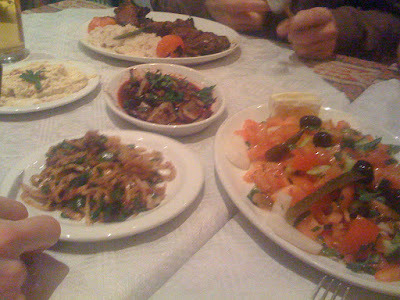 Sides were also exceptional - roasted onions in a pomegranate pickle were a fresh and attractive balance of textures and flavours, and a salad was nicely dressed with fresh herbs and black olives. Now, there were bits here and there that weren't perfect, obviously, but where it mattered Testi delivered in spades - fresh meat, fresh ingredients, well seasoned, well executed, cooked simply and presented honestly. It's everything you'd want in a local restaurant, and although it's not leagues ahead of others in the same style (Tas Firin, No19BC2, etc.) it just does everything across the board well enough to be that much ahead of the pack. I had a lovely evening, and I will certainly be back - only next time, perhaps I'll leave the testicles alone.... Damn, so close. It's really felt like Spring in London the last couple of days. Mornings have been clear and bright, the daytime air is dry and noticeably warmer than before, and it's even been light on my journey home in the evenings. And with the change in the weather the restaurants in the capital - well, the good ones - will start taking advantage of seasonal ingredients and revamp their menus, so it's out with parsnips and hotpots and game, and in with asparagus, spring lamb and lemon sole. Which is all very well for French restaurants, gastropubs and bistros, but how do you keep your menu fresh and relevant if you're a steakhouse and essentially serve the same premium meat and chips all year round? 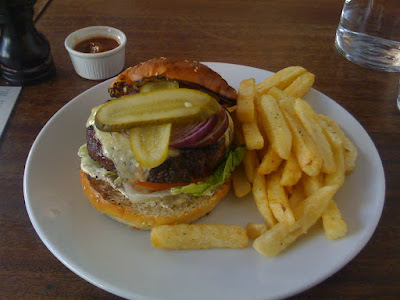 Top-end beef purveyors Hawksmoor have answered that in style by knuckling down and creating the best burger in London. I realise that's quite a claim to make. After all, the marketplace for what is cringingly known as the "gourmet burger" has exploded in the last couple of years, starting with the Gourmet Burger Kitchen, Hamburger Union and the like, and more recently going all top-end with Haché and Byron. And yet, while most of these places serve perfectly serviceable food (Haché in particular is worth checking out), nowhere has quite the obsession with quality and sourcing as the boys in Hawksmoor. They have, I'm reliably informed, been eating more burgers than are good for them in the last few months, honing and perfecting the recipe and paying detailed attention to every element, from the lightly-toasted brioche bap to the mixture of unusual cuts of meat from the Ginger Pig's superb longhorn cattle. The end result is worth every penny of its hefty £15 price tag. Served with their famous triple-cooked chips, the Hawksmoor burger comes with a couple of slices of delicately sweet pickle, a slice of fresh red onion, a slice of meaty beef tomato, some crispy lettuce doused in a whole grain mustard mayonnaise, and surrounded in billowy pads of sweet (but not too sweet) toasted brioche buns. 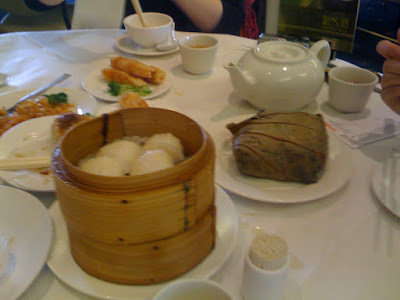 But despite these excellently judged accompaniments, the real star is the meat - juicy and complex, with an almost metallic flavour and satisfying, gelatinous bite. The beef from the Ginger Pig has, in my own humble opinion, a flavour rich and earthy enough to challenge anything USDA-branded from across the pond, and is the single most important factor that lifts this burger above all the competition. It is also, I would imagine, the reason why it's more expensive than all the competition too, but hey, you get what you pay for. 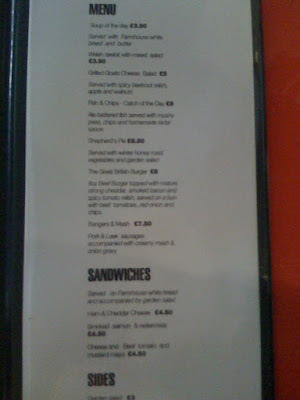 Also, and I realise it's early days, but I would have liked the option to customise my burger slightly. In the interests of research, and despite the suspicious glances of the serving staff, I removed the vegetables from the bun and ate part of the burger au naturel - just the bread, meat and cheese. It was wonderful. This was already my favourite restaurant in this part of town, and now they just happen to be serving up the best burger money can buy is not about to change that. Hawksmoor has long been a perfect example of how passion, technical skill and an almost dangerous obsession with quality and providence can create stunning results. The fact that they are beginning to apply that energy to the creation of new dishes is a most exciting trend. I can't wait to see what they come up with next. Our vision is one of simplicity and tradition, taking classic British staples and applying a modern interpretation. 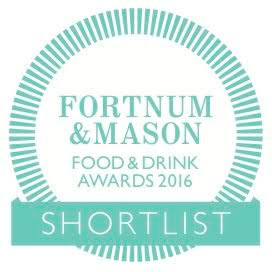 In layman’s terms we’re celebrating the food that London was built on! 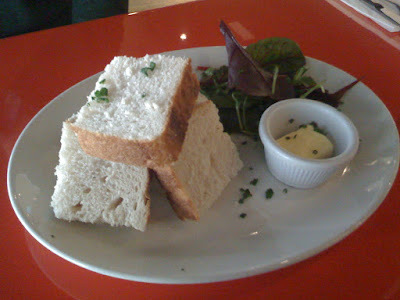 It's the kind of PR guff that strikes fear into the heart of any diner, and nothing more than PR guff it most certainly is, given that "celebrating the food that London was built on" at the Hoxton Pony appears to involve such traditional East End dishes as Welsh Rarebit, Grilled Goats Cheese Salad and, my lunch yesterday, burger and chips. 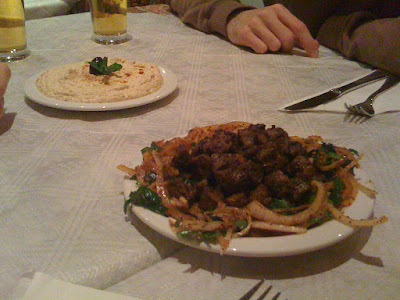 Though not quite inedible it was a pretty forgettable plate of food. 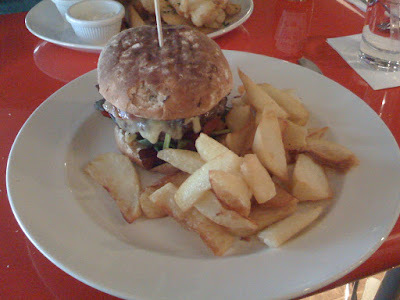 The meat was overcooked and grey, topped with a miniscule circle of bacon and inside a horrible dry and crumbly bap. It was also served with (I can hardly say this phrase without wincing) Fat Chips, although to be fair these were pretty nice - soft inside and crunchy out. 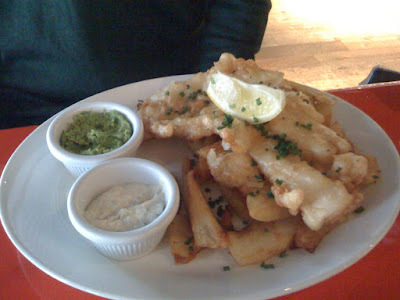 It was just as well that a companion's Fish and Chips came with the same chips as the fish itself was pretty awful - thin, flaccid batter covering a slimy portion of haddock. Worst of all, rather than the "mushy peas" mentioned on the menu, it arrived with a tiny pot of what I can only assume was crushed pea casings, dry, tasteless and offensively bad. God knows what they were thinking - or even if they tasted it before serving - but this awful concoction should never have seen the light of day, never mind been served to a paying customer. 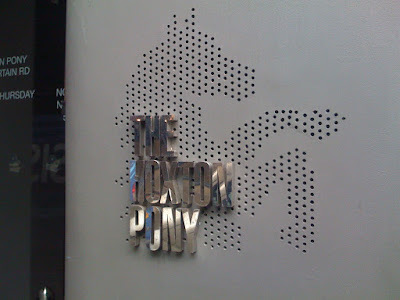 There are good things about the Hoxton Pony. The room is quite stunningly designed, all moulded plastic and curvy mirrors, and the lighting is so effective it's currently up for an award. The bar looked well-stocked and even though I was on the wagon due to it being midweek on a school day, my Virgin Mary was well made and nicely spiced. Service too was friendly. Just none of the good things involve anything produced by the kitchen. Look, I know what you're thinking. 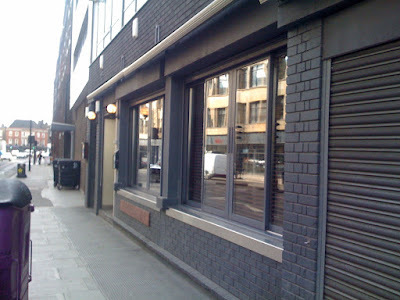 "Poncy Shoreditch Bar In Mediocre Food Shock!". But just because you're essentially a drinking den that has to serve easy food to increase your profit margins is not an excuse for doing it cynically or incompetently. The Music Hall, just a couple of doors up on Curtain Road, is basically a live music venue that serves simple grub to soak up their excellent selection of Belgian beers, but their food is honest and pretty tasty and very reasonably priced. And they don't bang on about "sustainable sourcing" or "modern interpretations" in an attempt to cover for the fact they're charging a tenner for a crappy burger. By all means, go to the Hoxton Pony, order a mojito and shout at your friends. But if you start feeling peckish after that third drink, settle your tab, walk up Curtain Road and feed your hunger at the Diner. You'll thank me in the morning. Never has the phrase "don't judge a book by its cover" been more appropriate than when applied to One-O-One seafood restaurant in Knightsbridge. In this genteel part of town, over the road from the stately, baroque Mandarin Oriental and next door to the clean bright lines of Harvey Nichols department store, squats the ugly grey edifice of the Sheraton Park Tower hotel, its mould-stained pods stacked up like breeze blocks, blocking out the sun and casting a depressing dirty shadow over Hyde Park. It is largely this reason that I've taken so long to visit, because despite various excellent reviews by people who eat out much more than I do, it requires quite a leap of faith that anywhere could serve anything worth eating in such a hideous building. But if anyone can, self-confessed seafood obsessive and head chef Pascal Proyart can. Amazingly, Proyart joined One-O-One a full nine years ago, and yet it seems to be only very recently that the restaurant is being spoken about as a destination. 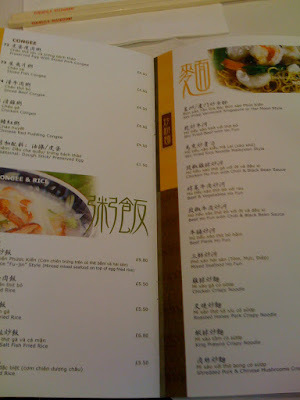 And ever on the cutting edge of restaurant trends in London, I visited last Friday. It is a blessed relief, not to mention more or less a requirement, that One-O-One is much, much prettier inside than out. 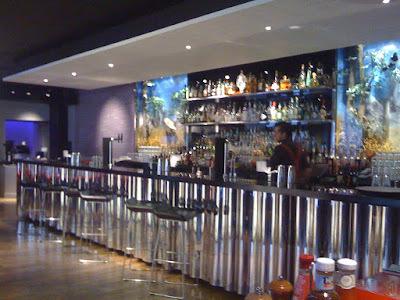 You enter into a large, crescent-shaped bar with a fancy glass table centrepiece. To the right of the bar, containing plush comfy chairs and attractive spot lit wood-panelled walls, is the restaurant itself - by no means a large room but with well-spaced tables and the atmosphere of a luxury cruise liner. Service is almost perfect - friendly without being obsequious, efficient without being snooty. Our party, as is often the case due to a combination of the London traffic and London weather, arrived in drips and drabs before 7pm but this didn't faze the staff at all and everyone's food arrived at once despite the orders being staggered somewhat. 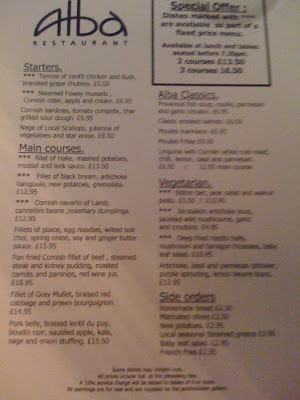 One-O-One does have a traditional 3-course A La Carte menu, but the done thing is to go for their 'Petits Plats' selection - you choose from 3 to 6 small courses (no prizes for guessing how many I went for) and, in a clever bit of organisation, it's possible for each person on the table to have a different number of courses. This is quite unusual for what amounts to a tasting menu, and yet I don't remember anyone ever obviously "sitting out" a course despite everyone ordering different numbers. Full marks to the front of house on this one. 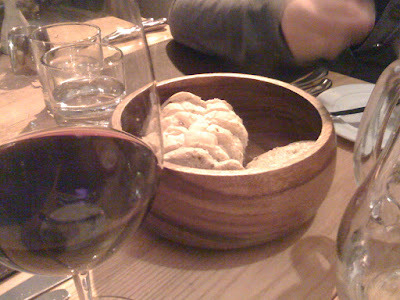 House bread is served with a choice of normal unsalted butter and an extraordinary salty seaweed-infused butter that looked like a Walnut Whip. It seemed to split the diners on our table down the middle, with some people relishing in the fishy flavours and others being not so sure. I loved it. 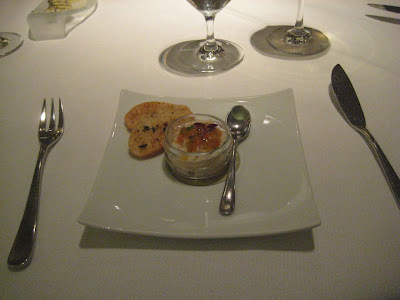 Amuse was a rather forgettable fish mousse of some sort topped with salmon roe. Fine, but considering this is the only dish of the entire evening that the kitchen is pushing onto you without you asking for it, you'd think they'd have free reign to do something a bit experimental - after all if you don't like it you can hardly ask for your money back. 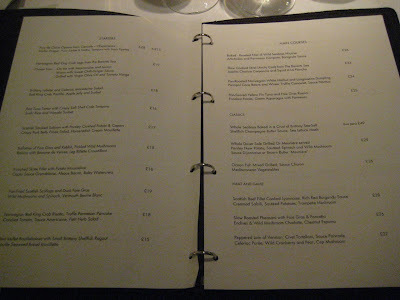 As it turns out I need not have worried that chef Proyart was playing it safe, judging by what was to follow. 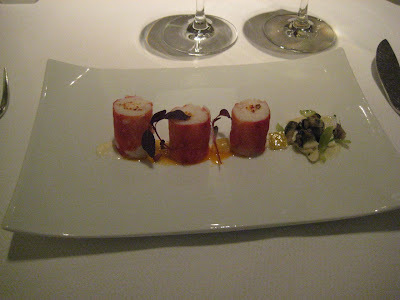 First of my selected petit plats was three cute little columns of the most unbelievably sweet and silky King Crab leg meat, served alongside a perfectly judged sharp hit of pickled winkles to cut through the crab. It was everything you'd want from a dish - honest, strong flavours from premium ingredients, cooked sensitively and with skill, and with a master's sense of balance of flavour. Full marks. 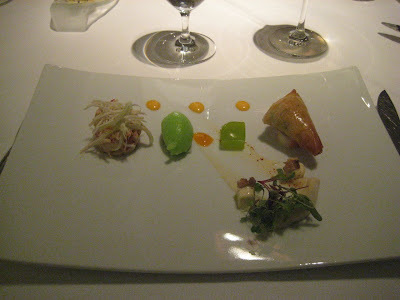 Next up, a little stack of lobster meat and celeriac (a great combination), a couple of presentations of apple, and a samosa (they called it a "pastilla") containing more of that gorgeous sweet crab meat. Amusingly, they first served this dish without the sorbet, and after I pointed it out whipped it away and brought it back con sorbet and rotated 180 degrees to try and make it look like a new plate of food. I didn't mind though, as the samosa was still hot and the service otherwise had been so superb. There were others who had this dish that evening who thought there was a bit too much going on here, what with the sorbet AND the jelly AND the hot samosa AND the lobster salad. But I thought it was just ambitious enough, and a very attractive plate of food to boot. Pan-Fried Scottish Scallops were unfortunately slightly disappointing. The scallops themselves were tiny and although of high quality and sweet, there wasn't enough of them to cut through the big slabs of oily preserved truffle they were lumped with. 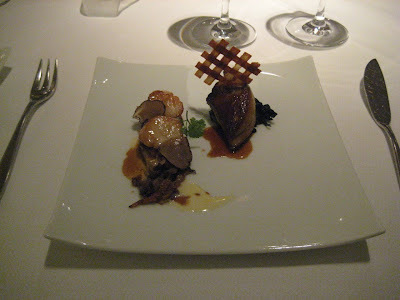 Also the foie gras was quite dry and "liver-y", and although it may seem odd to criticize liver for being too "liver-y", proper seared foie should be buttery and sweet and rich and not taste like one half of liver and onions. A good dish conceptually, let down by ingredients and execution I think. 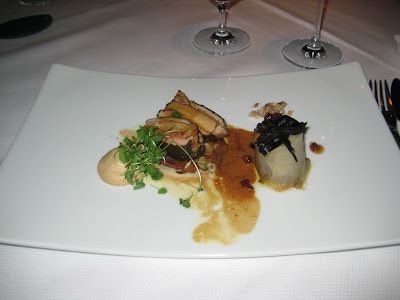 Slow Roasted Pheasant with (more) Foie Gras & Pancetta was much better. 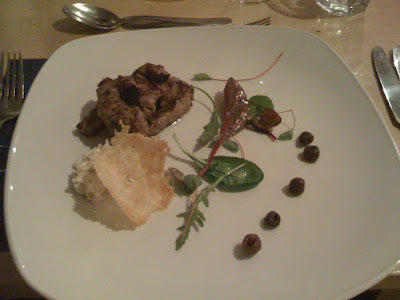 The pheasant had amazing texture, melt-in-your-mouth buttery-ness and great, deep flavour. A little accompanying endive charlotte topped with trompette mushrooms was slightly tough but had been cooked just enough to rid it of the bitterness without it turning into sludge, and a chestnut purée offset the whole thing quite nicely. A little messy in presentation perhaps but otherwise top notch Michelin cooking. 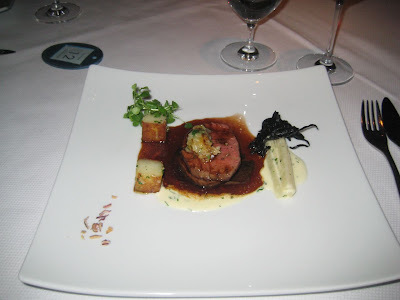 The last of the savoury courses, a medallion of beef fillet steak with a burgundy sauce, was again very good. The beef was clearly of very high quality and tasted strongly of cow (amazing how many don't), the rich sauce guiding and complimenting the meat instead of smothering it. More of those trompette mushrooms and a couple of cubes of roast potato provided vegetation. As with the King Crab and the pheasant, One-O-One knows when to let the superb ingredients shine through, and the star of the show in this dish was the meat. 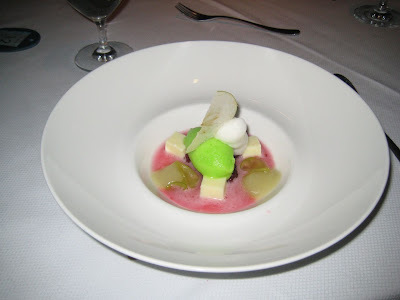 Dessert was a very attractive bowl of day-glo apple sorbet and chunks of apple, served in a light pink blackberry froth. It tasted how you'd imagine apple and blackberry to taste - nice enough but little more than a glorified fruit salad. Very pretty though, isn't it? 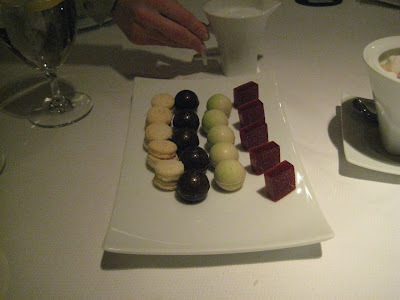 A few very pleasant petit fours arrived to offset the shock of the bill. 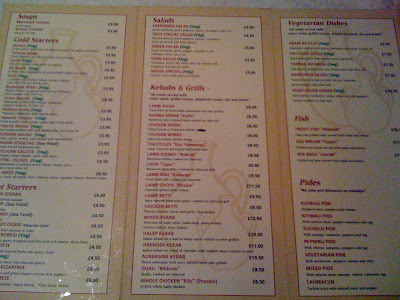 One-O-One is a proper haute-cuisine restaurant, and despite the 50% off the food offer (thank you Topable), I still managed to get through the best part of £100 just on my own. 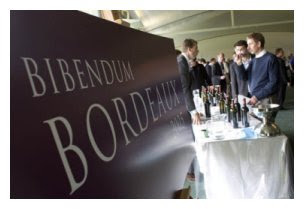 Having said that, we had plenty of very nice wine (the list is pretty eclectic), a glass of champagne to start and a lovely peaty Lagavullin 16 to finish, and I can honestly say that I felt the price I paid was very fair. Good food very rarely comes cheap, and these ingredients in particular - King Crab, lobster, black truffle (albeit preserved), foie gras - never do. And on top of these flashy ingredients you get sparkling service, glamorous surroundings and seven or eight superbly constructed courses of probably the best seafood in London. All you need to do is ignore the concrete monstrosity outside on top of it, and you'll have yourself a wonderful evening.